Jim Kurtti is the Director of the Finnish American Heritage Center at Finlandia University, where he is also the editor of the newspaper, “The Finnish American Reporter.” Kurtti was born and raised in the heartland of Finnish America, in the village of Bruce Crossing, the grandson of Finnish immigrants of Sami heritage. He studied at Suomi College, Helsinki University and the University of Minnesota where he graduated (1980) with degrees in Finnish Studies and Social Work. After 18 years as the Juvenile Court Administrator in Houghton County, Kurtti took over the leadership of the Finnish American Heritage Center. He also served as chairman of the FinnFest USA 2013, served for 16 years on the Salolampi Foundation for the Finnish Language Villages (Bemidji, MN), is a member of the Finlandia Foundation Copper Country Chapter, the Finnish American Chamber of Commerce – Upper Peninsula Chapter. He also is credited for the creation of the mid-winter Finnish festival Heikinpäivä, has taught Finnish in the Hancock and Houghton School districts and is a member of the North American Sami Siida. Hilary Joy Virtanen is Assistant Professor of Finnish & Nordic Studies at Finlandia University, where she directs this minor-granting program. She holds a PhD in Scandinavian Studies from the University of Wisconsin-Madison. A folklorist and anthropologist, her research interests include ethnicity in Nordic American and Nordic communities, with a special focus on Finnish, Finland-Swedish, and Sámi people. As a graduate student, she had the privilege of studying Finnish, Swedish, and North and Inari Sámi languages. 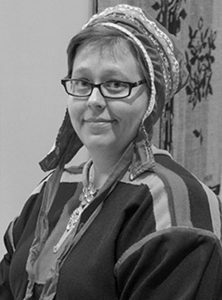 She teaches a class focusing on Sámi History and Culture at Finlandia University, and also includes materials on this group in her History and Culture of Finland class, representing the fact that Finland is one of the territories to which the Sámi people are indigenous. 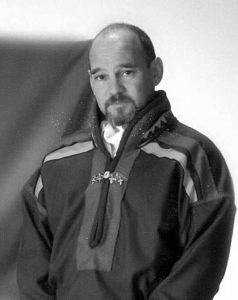 Gidagaa-bizhiw, Jerry Jondreau, is an Anishinaabe man of the Ajijaak (crane) clan. He is from the Keweenaw Bay Indian Community (KBIC) of the Lake Superior Band of Chippewa and has been residing in his community for the last 12 years. Jerry holds a Bachelors of Science degree from Michigan Technological University, School of Forest and Environmental Science. During his time in school, he began working as a wildland firefighter for the Bureau of Indian Affairs, gaining experience traveling the country, working in and alongside numerous other tribal communities. After graduation, Jerry took a position as the tribal forester for the KBIC. 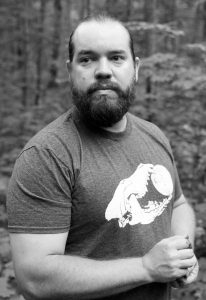 He learned what it means to be Ojibwe in a federal natural resource position, while working to maintain and promote Anishinaabeg cultural values. As time went on, Jerry found that his efforts may be best accomplished by going to the source: education. Jerry now works as the Director of Recruiting for the School of Forest and Environmental Science at Michigan Technological University, focusing on bringing diverse people and ideas to a field he still regards as important to his and all people’s future. He currently maintains the chair position of the Intertribal Maple Syrup Producers Cooperative which is looking to reestablish Tribal members and the sugaring tradition. Joanna Chopp is the Archivist at the Finnish American Heritage Center at Finlandia University. 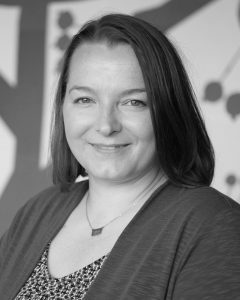 A native of Toivola, Michigan, Chopp has a BS in History Education and English from Northern Michigan University, and did her graduate work in Archival Studies at UW-Milwaukee. Before entering the archival field, she was a high school teacher in Ladysmith, WI for eight years, and has always had a strong interest in the many aspects of her family’s history. Through the research of many relatives, including her mother, Chopp can trace her Sámi heritage back to the 1600s. Even with such a long lineage, she often struggles with the idea of belonging to an indigenous group, and what exactly that means in different contexts. Panel discussion/Q&A follows screening of Sami Blood and Ogichidaa.